Dr. Wold is from Central Louisiana and proud to be back home serving his local community. Dr. Wold completed his college degree at Rhodes College in Memphis, TN. 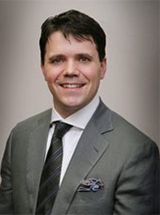 After medical school at LSU in New Orleans, Dr. Wold was awarded the opportunity to pursue his ENT training at the Mayo Clinic in Rochester, MN. During his five year residency he was taught the latest and best medical and surgical techniques for disorders of the Ears, Nose and Throat. In addition, Dr. Wold learned the Mayo Clinic’s philosophy that the needs of the patient always come first.